The iPhone 3G has two small screws on the bottom of the device on either side of the standard docking connector — a stark design change from a Apple, a company known for hiding screws from sight on handheld devices like the former iPhone and iPods. A tear-down of the iPhone 3G by iFixit reveals that device’s battery is not soldered — the first-generation iPhone’s is. Furthermore, the iPhone 3G’s LCD screen is separate from the capacitive touchscreen, theoretically making replacement of a broken glass layer much less expensive. This means that if you’re willing to void your warranty, perform relatively complex disassembly process and get your hands on a replacement, you can in fact insert a new battery in the iPhone 3G without worry of seriously damaging the device. 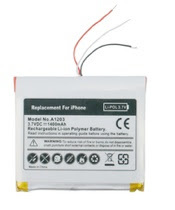 Apple’s official iPhone battery replacement program is priced at $86 total. Regarding the original iPhone, Apple said the battery will retain up to 80% of its original capacity after the 300-400 charge cycles and adds “You may choose to replace your battery when it no longer holds sufficient charge to meet your needs.”] All data stored on the iPhone is erased in the process. As such, maximizing the amount of time before replacement is necessary is of substantial concern. Users are also seeking to extend the time between iPhone charges by reducing power consumption, so we’ll attempt to address both issues.